Get all the ink you need without paying a fixed monthly subscription. With ReadyInk technology a new cartridge can arrive before your last one runs out. It’s free to register a printer for ReadyInk. You’ll simply need your serial number. It’s located on the side of your printer packaging or on the back of your device. Check back to discover further special promotions. All of our inks are available as individual cartridges, meaning you only ever have to replace the colour that has been used. Our reliable products also reduce the chance of misprints, and the inks are tested so you can trust the quoted yield. With an established history manufacturing high-quality printers since 1968, you can trust that our models will be dependable and work efficiently. We're always looking for new ways to improve our customers' experience and provide them with a solution that fits their needs. ReadyInk enabled printers give our customers a hassle-free way to get all the ink they need without buying it upfront or signing up to a subscription. Our products undergo extensive research and development and are manufactured in high-tech facilities. They're engineered to be reliable, give you the best features and deliver quality results. Now that you have registered, you can carry on printing as normal without worrying about when the ink will run out. The ReadyInk technology will work in the background and will sense when your printer is running low. A notification is sent when your printer is running low on ink. You simply decide if you want to pay for more ink. It can then start the issuing process for sending a new cartridge. Ensuring you never run out of ink, the new cartridge will arrive before the last one runs out. Check to see if your Epson printer is suitable for ReadyInk. The models below from our previous portfolio are also eligible for ReadyInk. Register your product for ReadyInk here. 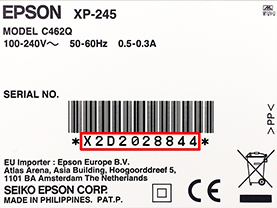 The serial number is located on the side of your printer packaging or on the back of your device. Your product cannot be registered for ReadyInk.